Tobacco Farm Life Museum background sheet. Located in the middle of North Carolina’s world famous Tobacco Road, nearly half of the nation’s billion pounds of flue-cured tobacco is grown within 50 miles of the museum site each year. What more fitting place could there be for such a museum honoring the farm family’s way of life in Eastern North Carolina. Organized in 1983, a number of area farmers began a series of guided tours of their tobacco farms for visitors interested in learning more about the bright leaf. Visitors were thoroughly fascinated, and the tours grew in popularity. Even today, the museum will conduct tours to area farms, and the contrast of farming in the early 1900s can be compared to today’s modern methods. 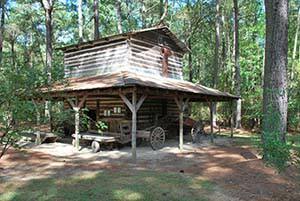 Local farm families began donating farming tools and equipment to the museum, some items had been used for decades to plant tobacco in the rich Carolina soil. The 6,000 square foot museum has an abundant inventory of farming artifacts, textiles, children’s games, kitchen equipment, medical implements and other tobacco memorabilia. Exhibits range from early harvesting techniques and tobacco auctioning to soil conservation and many examples of authentic tobacco advertising from the 1930s.